It is now 10:20 PM ET Time on Wednesday, April 24, 2019. This competition is closed by the host. See cancellation notice below. We regret to inform you that the 2016 Lake Lure 1 Mile & 5K USMS Open Water National Championship to be held August 12-13 has been cancelled due to weather related circumstances beyond our control. We were informed by USMS officials that a USMS sanctioned OWS to be held in Greensboro, NC, July 23-24 had been cancelled due to water temperatures above 85 degrees. It was suggested that we check the water in Lake Lure. The water temperature readings made on Wednesday, July 27 were an extremely high 89-90 degrees. USMS OWS rules as restated in our Safety Plan are very clear on this. According to USMS Rule Book Part 3, Article 302.2, a swim shall not begin if the water temperature exceeds 85 F.
OW-102.3.5 Recommended Method for Determining Water Temperature — Using an accurate thermometer, the event host should take three to five measurements at various places on the course—12 to 18 inches below the water surface and no closer to the shore than 25 meters (if possible) —within one hour before the start of an open water swim. The host should average these measurements, post and/or announce the resulting average temperature at least 30 minutes before the start of the swim, and announce it during the pre-race staff safety and swimmers’ meetings. With over 220 entrants traveling from more than 30 states we knew time was of the essence and an immediate decision to cancel the events was our only course of action. While terribly disappointing, this decision was the right thing to do for your safety, which is truly our first priority. The Lake Lure Olympiad is a 501(c)3 non-profit organization run completely by volunteers with all profits going to area charities. You may choose to donate your registration fee to the Olympiad. We will send you a letter for tax deductible purposes. If you would like to continue with your plans and come for Olympiad weekend to enjoy all there is to offer in Lake Lure we will give you a full refund of your registration fee minus 25% for associated costs of setting up for the Championship Race. If you do not select options 1 or 2, you may request a 50% refund. Please respond to this email by listing your choice of option 1, 2 or 3 in the subject line of your reply. If you have reservations with Rumbling Bald Rentals and wish to cancel them they have graciously agreed to extend their reservation cancelation period for three days with a 100% refund. Please contact them immediately if you do not plan to come for Olympiad weekend. We hope you will join us for the Largest Sports Festival in Western North Carolina. If you choose not to attend it is our sincere hope that this advance notice will assist you in making the best of this disappointing news. This is our twelfth Olympiad Festival and our first cancellation of a race. We deeply regret any convenience this may have caused you and your family. We truly enjoy having the swimming community at this event, you are a fun group and we will miss this race very much! Sanctioned by North Carolina LMSC for USMS, Inc.
Lake Lure is a well-known destination for thousands of visitors each year from around the country, Canada, and abroad. Located in western North Carolina, the town sits in the heart of Hickory Nut Gorge, east of Asheville. Lake Lure is widely recognized as one of the most beautiful man-made lakes in the world. We are confident you will agree. 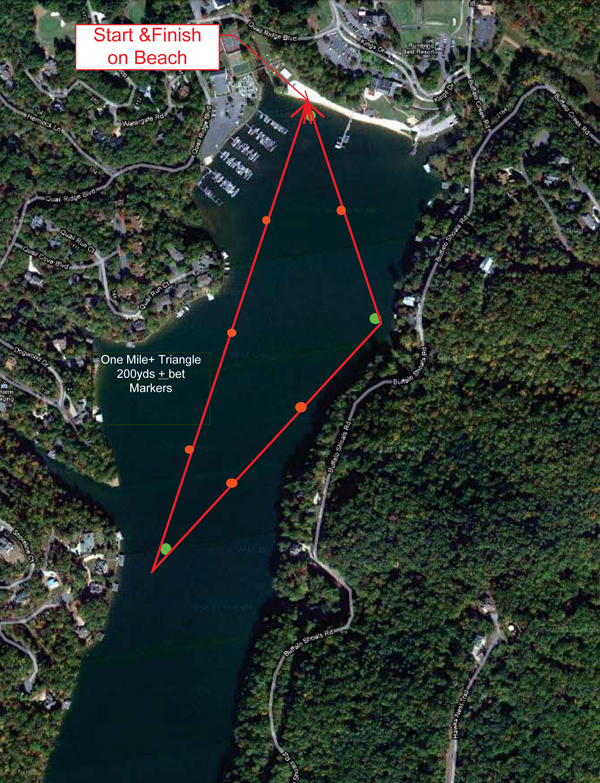 The Lake Lure Open Water Swim is hosted annually by the Lake Lure Olympiad, a sports festival for the entire family. The USMS 1 Mile and 5K Open Water National Championship Events are open to all 2016 USMS & FINA registered MASTERS 18 years or older on race day. Foreign swimmers are not eligible for All American status. One event membership is not allowed in the national championship. You may take care of membership registration during your event entry process. Current 2016 U.S. Masters Swimming rules will govern this event. Online Entries Only. Online entries will be accepted until 11:59 PM EST, Tuesday, August 9, 2016. Race Day Entries will not be accepted. The 1 Mile race entry fee is $45 through April 30; $55 May 1 through August 9. Collectible long sleeve T-shirt is included with entry (see image above). Your name will be on the front of your National Championship long sleeve T-shirt if you register before midnight (EST) Sunday, July 27! Those who register after this date CANNOT be guaranteed a shirt. Please keep this in mind when registering. Transponder chip and back-up timing provided by www.setupevents.com. Note there is a $30 fee for failing to return the transponder chip device. Safety boats will monitor the entire course and medical personnel will be on-site. Swimmers must wear the swim cap provided, must have their race number on their arms, and must follow all announced safety rules with out exception. Safety plan. Swimmers who cannot complete ONE MILE in less than 60 minutes should NOT enter; swimmers on the course after the time limit may be stopped and listed as DNF in the results. Swimmers who cannot complete 5K in less than 2-1/2 hrs should NOT enter; swimmers on the course after the time limit will be stopped and listed as DNF in the results. 1 Mile entries will be seeded fast to slow using submitted 1650 yard time. Entries will be divided into waves and started every 15 seconds. 5K entries will be seeded fast to slow using submitted 2 mile time. Entries will be divided into waves and started every 60 seconds. 18-24, 25-29, 30-34, etc. in five year increments, as high as necessary for both men/women. Age determined as of race day. USMS Long Distance National Championship medals will be awarded to the top 6 finishers in each gender/age group. USMS National Championship patches will be awarded to the first place finisher in each gender/age group. Results will be posted at www.usms.org, www.lakelureolympiad.com. If on the established date of the swim, weather or disaster necessitates cancellation there will be NO REFUNDS, but if present you will receive your collectible T-Shirt. Come join us, and remember there’s something for the entire family & you will have the time of your life.